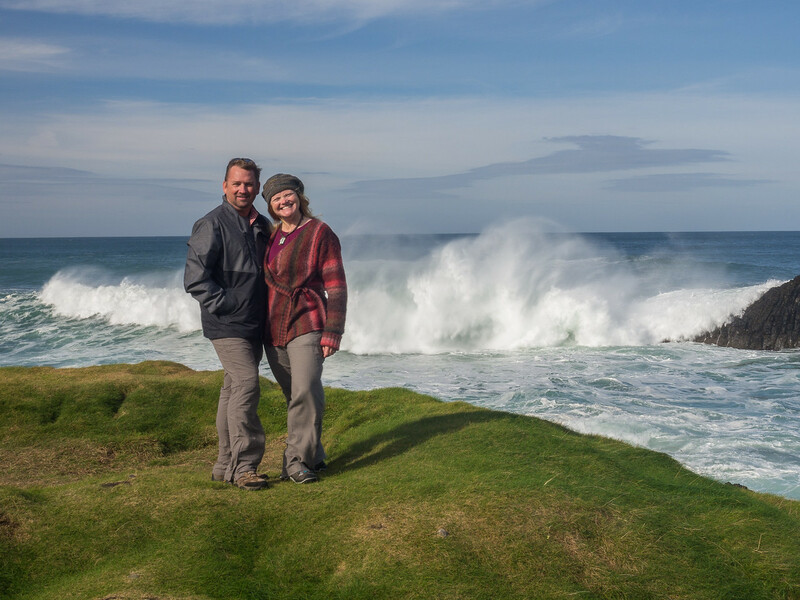 Dave and I have done our fair share of hiking around the world. We've trekked through the Himalayas to Everest Base Camp, climbed Mount Kilimanjaro and South East Asia's highest peak. We've visited countries known for their hiking and spent days trekking through difficult coastal routes and treahcerous mountains. We never take any of these hikes for granted and always make sure we have the right gear and proper travel medical insurance. It's when we're taking more relaxing vacations that we let our guard down and make mistakes. Before leaving for our latest set of travels a couple of months ago, we wanted to pack as light as possible. We were going to be crisscrossing the globe between different climates so we didn't want to carry too many extraneous things since we already had to pack wardrobes for different weather. The heaviest and most cumbersome items in our packs are always footwear. We talked long and hard about what shoes we'd be taking. We'd be hiking through the hills of Ireland, walking on beaches of Mexico and Sri Lanka, exploring the ancient cobblestone streets of Santorini and walking through the chic cities of Hong Kong and Athens. Something had to go. Dave decided to leave his hiking boots behind and trek in all terrain shoes. I was considering this, but when Keen offered me a pair of hiking boots to try out, I opted for using them instead. The boots were nearly as lightweight as my shoes, and I loved the colour I chose so I figured they'd look good on the trail or in the bar. It turned out I made the right decision. Dave getting a shot of the Wicklow Mountains. 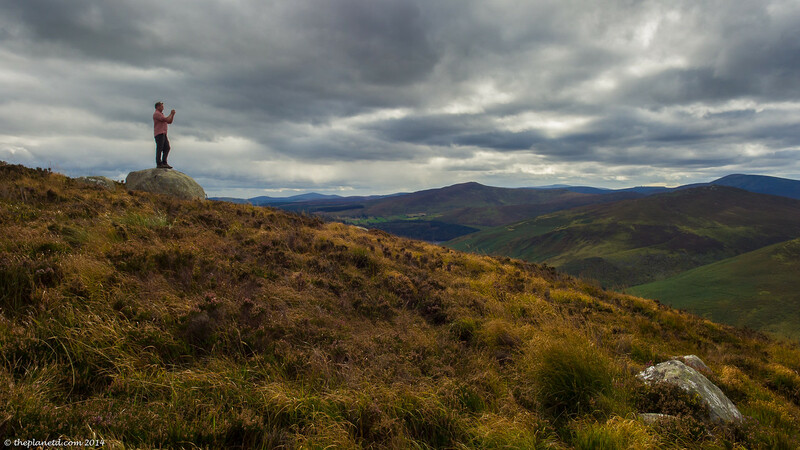 During our travels through Ireland, Dave and I were driving through the picturesque Wicklow mountains. We couldn't help but pull over at nearly every turn for a photograph. This is a popular area for hiking treks in Ireland and we took many walks on the trails leading from the road. It wasn't a planned hike, but it was something that we couldn't pass up. Getting up to the top of the hills overlooking the steep valleys below was something that couldn't be missed. As I sat on a rock sending a tweet out of the scene below while waiting for Dave who ran down a hill to take one last photograph I heard a scream. “DEB!” Uh oh. I immediately jumped to conclusions and worried that Dave had fallen off the side of a cliff. I ran as fast as I could towards the scream, but it seemed to take forever. I kept calling Dave's name but he didn't answer. Once I reached the crest of a hill and noticed him hunched on the ground. I breathed a sigh of relief. Sure, he was hurt, but he wasn't laying below on the valley floor. It turned out that Dave had stepped in a hole and sprained his ankle. He couldn't believe it happened. He had hiked on all seven continents through all types of weather and different terrains, and here he was sitting on the ground with a swollen ankle filled with so much pain he could barely move. There were women out here walking in wedge heels. He shouldn't have sprained his ankle! Dave looks pretty happy on that scooter. This is where the moral of my story comes in. No situation should ever be taken lightly. Even if you think you are out for a Sunday stroll (it was actually a Sunday when this happened) you should still wear proper footwear and be prepared. 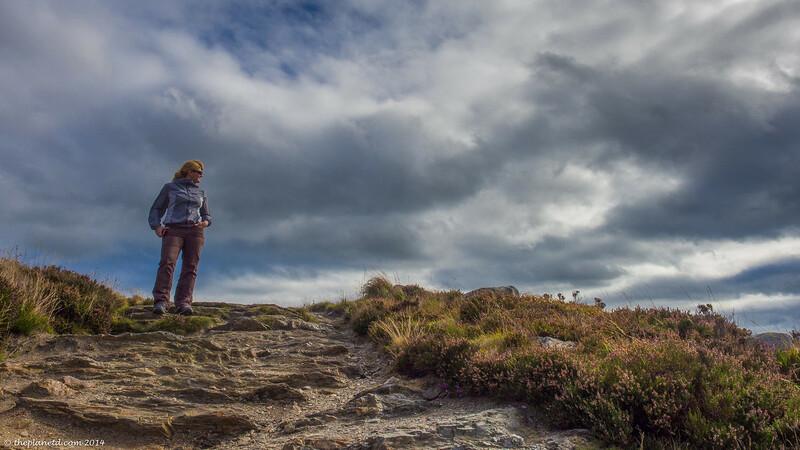 Deb hiking the Wicklow Mountains. We both agreed that had he been wearing his hiking boots that went above the ankle, he wouldn't have suffered as much damage. Good hiking boots support the ankle and help keep feet from twisting and turning when taking a wrong step. Now that his has happened to Dave, I don't think he'll be leaving his hiking boots behind. Hiking Boots, I like it! I had never given much thought to hiking boots before. I am someone who is pretty comfortable in anything from flip flops to high heels so when buying hiking boots, I normally went for what was on sale and if they had it in my size. I'd always heard of people raving about Keen boots. 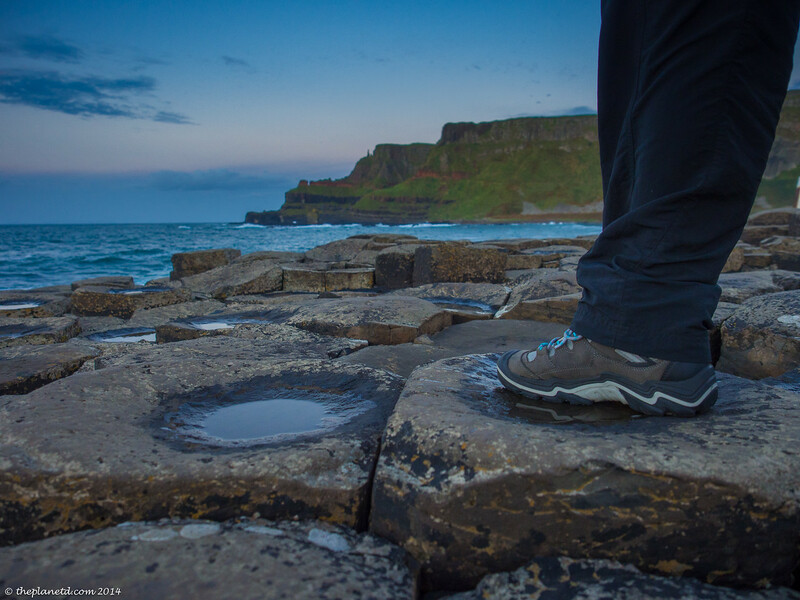 Whenever we take part in twitter chats and the question comes up, everyone mentions how they love their Keens! Needless to say, I was excited to give them a try. My Keen Durand Mid Boots are completely waterproof. It is true, they were put to the test over and over again in Ireland as it poured rain the last week of our travels. My boots are stylish – I didn't bring dress shoes or boots with me on this trip but when attending a conference or going to a pub, I felt comfortable in my boots. They are by far the most versatile hiking boots I've ever had. I'm not embarrassed at all to wear into a nice hotel restaurant. My boots are sturdy – I always felt secure walking in my Keens. I jumped on rocks, balanced on bridges and trekked over uneven terrain. Each step I took felt secure and solid. I never once worried that my ankle would collapse. My boots smell good – I have a problem with foot odour when wearing hiking boots. My feet sweat and I always seem to have smelly feet when I take them out of my boots. I couldn't believe that I wore these boots day in day out for weeks at a time and a smell never developed. When they say they are breathable, they mean it. My Keen comfortable – I am normally a flip-flop kind of gal. I hate wearing shoes. But I wore my Keen boots for 3 solid weeks as we travelled Ireland and my feet felt great. I could walk for days in these babies! I love my new hiking boots and as soon as we get home, Dave is going to order a pair of his own. No more skimping on items in our luggage in exchange for safety. A sprained ankle can really ruin a vacation. We won't be letting it ruin ours again. This post is a part of my collaboration with Keen Footwear, but the review and views are my own. If I didn't like them, you'd know about it. 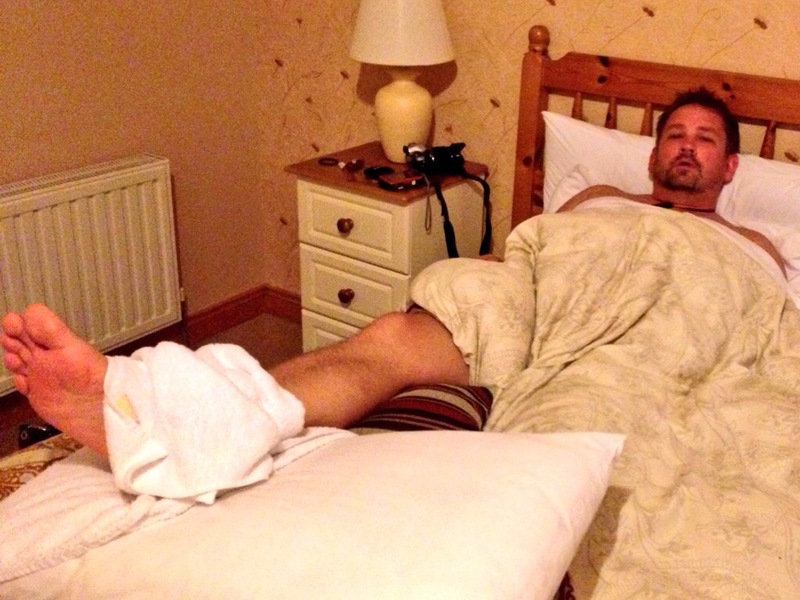 7 Responses to "One Giant Step, Why hiking should never be taken lightly"
Oh darn about the sprain Dave, hope it’s on the mend. I’m a Keen gal through and through too, my boots feel like a pair of slippers. They rock! Great post! You’re so right, hiking is no joke and having the right shoes is so important! I also think my Keens are the bomb – I got them stuck in quicksand one time and when I took them off later my socks were completely dry!! The waterproof element makes hiking so much more comfortable…. If you like hiking, then you will definitely like this trail. Dodo trail is a must, discover the most beautiful places in Mauritius. I’ve been wearing breathable hiking shoes for a while and I love them, but I can see your point with the boots. Unfortunately, with limited space in the suitcase, boots aren’t always going to fit. Guess I’ll stick with less rugged hikes for now. Hey Matt, Bes of lus with the hikes. 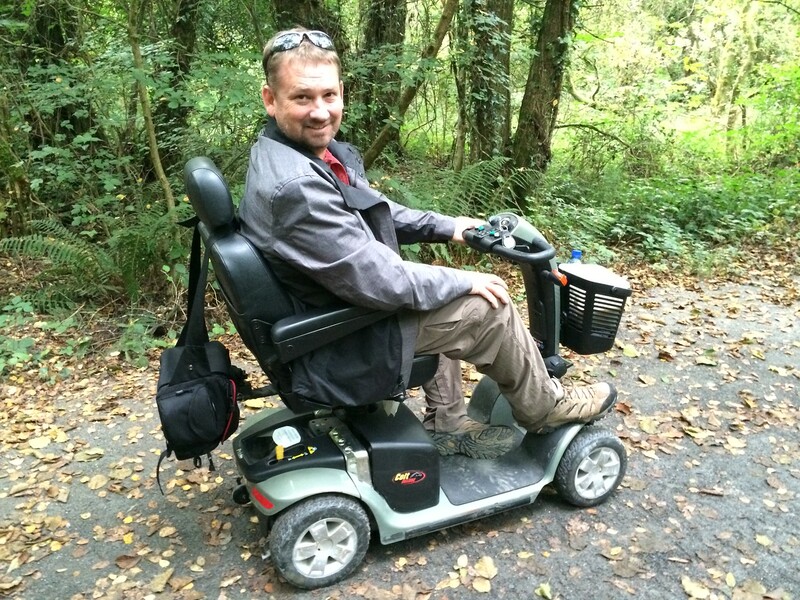 However, it was the less rugged hike that Dave sprained his ankle. We thought we’d be ok and then next thing you know, he’s down and out. We really do think that if he had his higher boots, he wouldn’t have had such a bad sprain. Just food for thought. We learned the hard way. Awesome post! Thanks a lot for sharing. Really very informative and very useful post about best hiking boots. Very interesting. I like it.